This past weekend in New York, the United Nations created a Facebook Live filter for World Humanitarian Day that let users overlay their real-time clips with augmented reality, particularly scrolling copy that told stories about civilians who have been affected by conflict. In Times Square, AR-enhanced videos aired on one of the iconic, commercial intersection’s large billboards. The endeavor was powered by Facebook’s 4-month-old AR system, dubbed Camera Effects Studio, which is getting the attention of brand marketers. While AR is still exploratory territory for marketers and media companies, its pixelated push to the mainstream has gotten a series of boosts this year from some of the biggest digital players. Snapchat—with its wacky filters and other virtual overlays—has continued to be popular among teens (even if Wall Street doesn’t like its pace). Apple, which has long been seen as a potential AR game changer due to the popularity of its iPhone and iPad, seems primed to give AR the turbocharge it needs to attract older demographics. 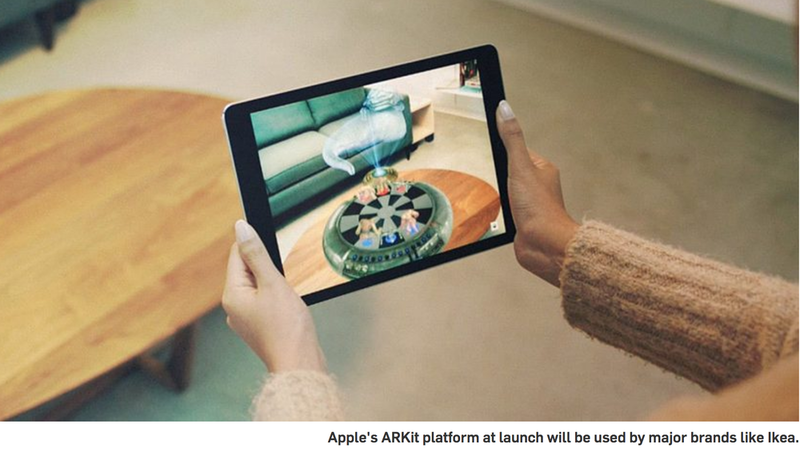 When the Cupertino, Calif.-based company releases its iOS 11 mobile operating system in September, hundreds of millions of Apple-device owners will have augmented reality at their fingertips with a set of features called ARKit. Ikea, which will be one of the first major brands on Apple’s AR platform at launch, is developing an app that allows customers to see what furniture and other household items would look like in a three-dimensional view inside their homes. Ikea also plans to introduce new products in the AR app before they hit store shelves. An AR visit to a Japanese-Canadian internment camp aims to inspire empathy. Other brands and their agency partners are working on prototypes and developing spatial storytelling by layering detailed imagery, pertinent information and other brand-centric assets into physical spaces. For instance, PGA Tour has tapped Possible Mobile to develop an immersive rendering of 3-D golf course models in ARKit that should go live in the next six months. It would seem the initiative is generally driven by the sport of golf’s recent problems courting millennials. But Luis Goicouria, svp of digital platforms and media strategy at PGA Tour, contended that the 3-D experience is being built for all demographics. Apple’s ARKit should be ripe for innovative storytelling. With that in mind, Toronto-based digital production firm Jam3 is using the platform to create a historical and educational narrative app called East of the Rockies in collaboration with Joy Kogawa, an author and former internee at a Japanese-Canadian internment camp. The experiential app will illuminate aspects of detainee life in three chapters on the user’s smartphone screen, with each new episode triggered as users virtually “walk around” the environment and get close to different locations. “[It will] create a lot of empathy in ways that I didn’t think was possible in a digital medium,” noted Jason Legge, producer at Jam3. The possibilities will only become more self-evident as augmented reality grows. The number of users is expected to jump by 36 percent between now and 2020, when 54.4 million Americans will regularly engage with AR, according to eMarketer.